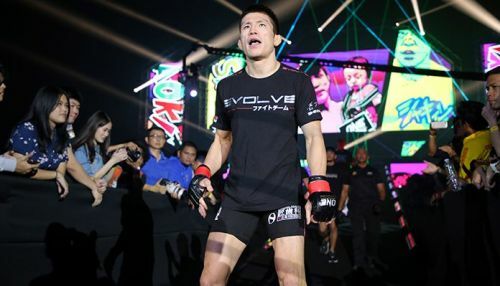 Japanese legend and former ONE Lightweight World Champion Shinya “Tobikan Judan” Aoki is living out the core values of ONE Championship, applying the principles of martial arts to his life. If you ask him, Aoki would practice martial arts until the day he dies. The humble Aoki, although brash and confident inside the cage when he performs, does not think of himself as someone special. In fact, he would rather live a normal life when he is not competing. “I do not like being called a legend,” Aoki said. The former lightweight titleholder’s happy place is at the gym where he spends countless hours training to hone his craft. When he is done for the day, he just strolls around town in a simple outfit. “I’m at my happiest when I’m concentrating on being a martial artist,” Aoki said. Aoki is booked for a much-anticipated rematch with reigning ONE Lightweight World Champion Eduard “Landslide” Folayang in the main event of ONE: A NEW ERA which takes place at the Ryōgoku Kokugikan on 31 March. It’s ONE’s inaugural show in Japan, and it is absolutely stacked with four World Title bouts and several other compelling matchups. Early on, Aoki worked as a policeman, but knew deep down inside that it wasn’t what he wanted to do with his life. There is no doubt he would have been a tremendous law enforcer, but his heart and mind were telling him to quit his job and pursue his passion for martial arts. After three months, Aoki was on his way to becoming one of the greatest athletes in Asian history. “If I could just train all day and do martial arts, that would be awesome,” Aoki said. Aoki certainly feels like he made the right decision. After garnering multiple accolades over the course of a stellar 16-year professional career thus far, the Japanese legend finds himself on the brink of another World Title run. If he can defeat Folayang, Aoki will no doubt be in consideration for the title of greatest Asian mixed martial artist of all time. But regardless of victory or defeat, Aoki merely wants to remain a martial artist for the rest of his life. “I want to keep being a martial artist for as long as possible,” Aoki concluded.